Pedigree Query • View topic - TARQUIN SILK (1999) --- A sire? Any information? TARQUIN SILK (1999) --- A sire? Any information? A new descendant from the grey-tail-male lineage of Dancer's Image has been informed, albeit he died a few years ago. His name is MAJALES. Who knows if he left an entire grey son. It has been made public the interest of saving Dancer's Image grey-tail-male lineage via Tarquin Silk, who seems to be his only surviving grey descendant. Is anyone interested in saving this lineage? If yes, please post your interest here and let her owner be informed. Thanks for your interest. Let's see if any of our members may help Tarquin Silk's owner and breeder post some interesting photos she took of him ----someone with more expertise on posting photos! Thanks in advance for any assistance. Hi from Valerie in South Australia. I don't think anyone appears interested in Tarquin, a few negative remarks were made about Greys, they are only a color, anyway some like a nice calm grey, Tarquin Son.ULTIMO RAE is a Brown same color as his WINNING Dam.OCTICKLE by Eagling,Nureyev. Ultimo Rae is only unbroken now as I had a serious accident, and could not afford tio pay somebody else to break him in, i usually am able to do breaking & schooling, but due to my accident have since not attempted. That is the sadness i face now with a beautiful Colt not broken in, but handled of course a lovely natured Horsde, as his his Stunning Sire.TARQUIN SILK, even if some on this forum think Greys are just white horses with age, really a good horse color does not matter, as even black horses also get Melenoma's. So please don't condemn Greys, the HOT sun causes the problems with no shelter. Interesting duo. Good grey candidate for a potential grey-homozygous, grey-tailmale produces if both are crossed with Tarquin Silk. produce if she is crossed with Tarquin Silk. “I have a Stallion named TARQUIN SILK whom I bred, his Dam Eureka Girl was by Loving Jim,by Jim French/Graustark,Ribot. Her Dam was National Maid,/Coronation Boy/Never Say Die bloodlines.etc. 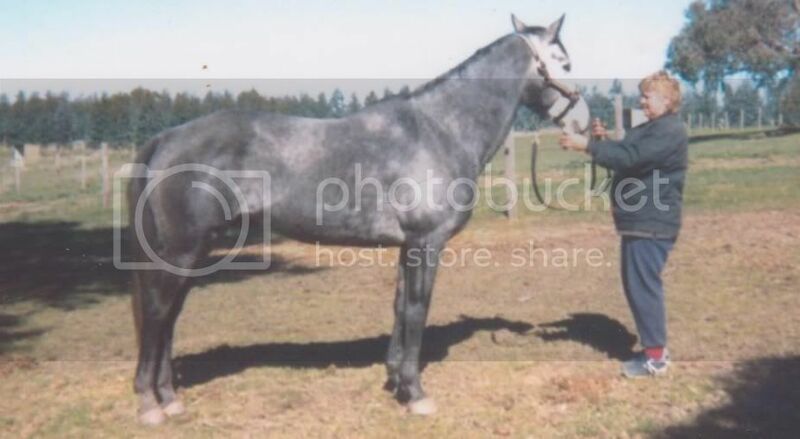 Tarquin Silk was born in 1999 and is a Steel Grey His Sire is Steady Eddy/by Go Dancer. I bred a foal by Tarquin Silk out of my Mare Octickle,by Eagling/Nureyev/Northern Dancer. WHO SEEMS LIKE THE ONLY “GRAY-TAIL-MALE-LINEAGE” CARRIER LEFT BY THE GREAT NATIVE DANCER? Any update on this lineage? Post subject: Re: TARQUIN SILK (1999) --- A sire? Any information? Any new information from Australia about TARQUIN SILK? one left coming from the great Native Dancer. If anybody has found another strain, please let us know. The only asterisk is that OGURI CAP is also carrying his grey color via his grey dam, White Narubi, whose color has no relation with Native Dancer, but from the a different grey strain, namely, Silver Shark. So who knows for sure if Native Dancer is the unequivocal grey gene provider here.